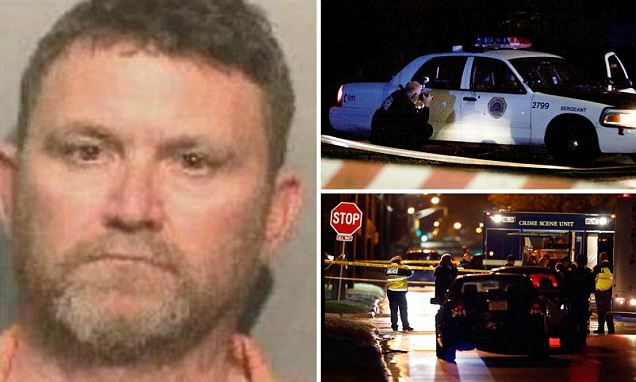 Why did Scott Michael Greene ambush two Iowa police officers? Home Scandal and Gossip Why did Scott Michael Greene ambush two Iowa police officers? To what degree did Scott Michael Greene’s extreme dislike of African Americans and reticence towards police lead to him targeting Iowa police? Fugitive Scott Michael Greene has been identified as the individual responsible for the shooting deaths of two Des Moines, Iowa police officers early Wednesday morning. Authorities urged anyone coming across the suspect to call 911 and not approach the man. Update: Police issued a statement Wednesday morning to say that the suspect has since been taken into custody. A report via the Des Moines Register described Scott Michael Greene as 5’11, weighing 180 pounds, with brown hair and green eyes. The fugitive was last seen driving a blue 2011 Ford F-150 pick-up truck with a Iowa license plate number 780YFR. The truck has a silver topper with a ladder rack. Greene’s identity was released a little more than seven hours after two police officers in Des Moines were found shot to death in their patrol cars. 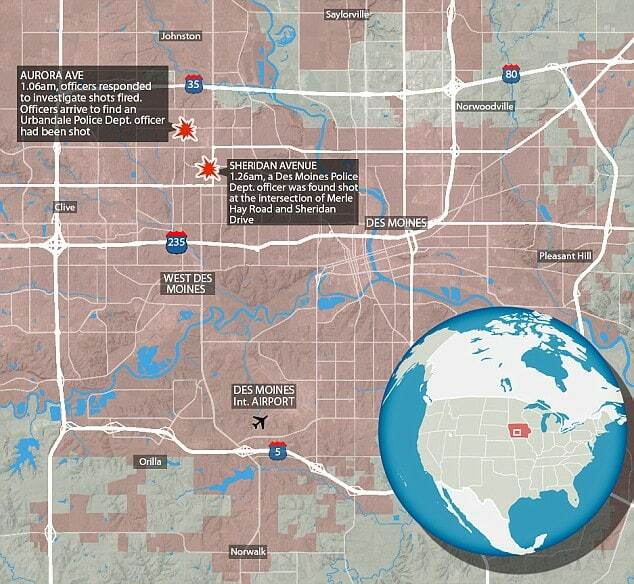 The first officer was shot dead in his patrol car outside Urbandale High School at 1:06am. Twenty minutes later, responding officers found a second officer dead in his car just two miles away. The first officer was declared dead at the scene while the second officer died after being transported to Iowa Methodist Medical Center. The names of both officers to date has yet to be released. The Des Moines Police department currently in the process of informing the officers’ next of kin. Both officers were from the Urbandale Police Department, which patrols the northwest Des Moines suburb. The department has about 50 officers. Urbandale Police Sgt. Chad Underwood said he believes this is the first deadly Urbandale police shooting. A report via the dailymail notes Urbandale officers equipped with body cameras, with the caveat that they don’t run constantly, raising questions whether there was video of the shootings. The early morning police shootings led to Des Moines Police saying there is ‘a clear and present danger’ to its officers. Why the wanted man targeted the police officers has yet to be necessarily understood, with police declining to speculate on Scott Michael Greene’s possible motives. Of note, a report via heavy describes Greene having been arrested numerous times according to court records. Details of the cases, including whether he was convicted, were not immediately available. Scott Michael Greene was arrested in 2001 and charged with domestic assault, assault causing bodily injury and fourth-degree criminal mischief. He was also charged in 2010 with driving under the influence and in 2014 with first-degree harassment. 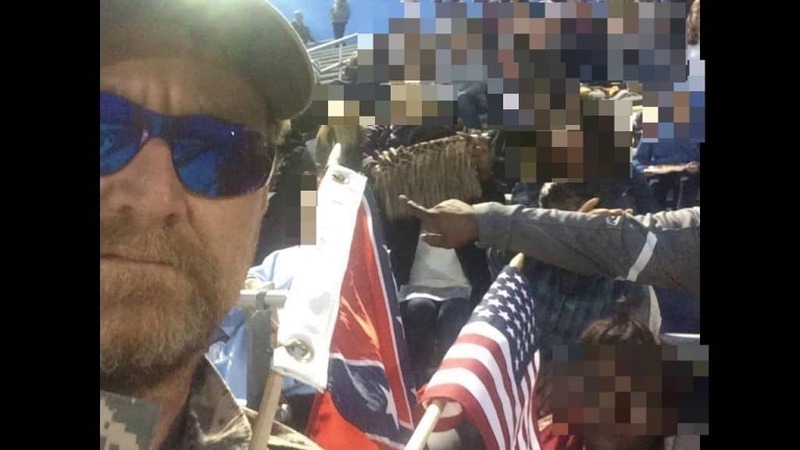 Of disconcert, references to the assailant’s Facebook page show Scott Michael Greene had clashed with police last month, leading to the man being made to leave a local football game after flying a confederate flag during the National Anthem. 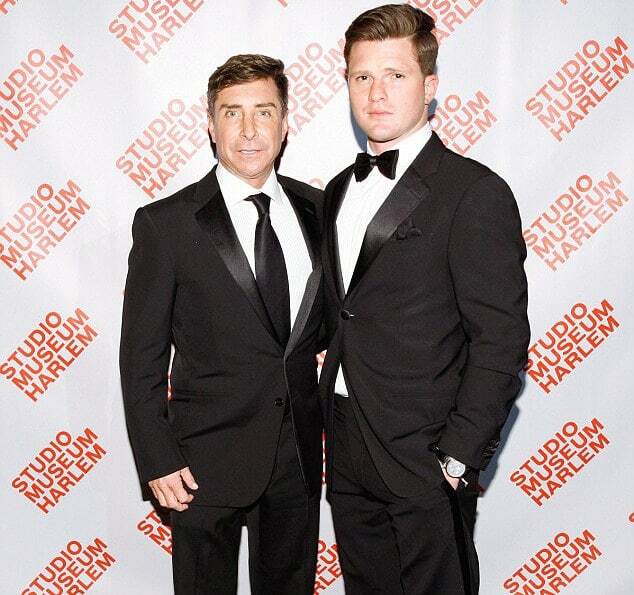 Scott Michael Greene pictured just two weeks ago after causing a commotion at a local football game. The posting included a photo of the man in the stands at a local high school holding American and Confederate flags along with a 10 minute video of him recanting after being forced to leave the game. 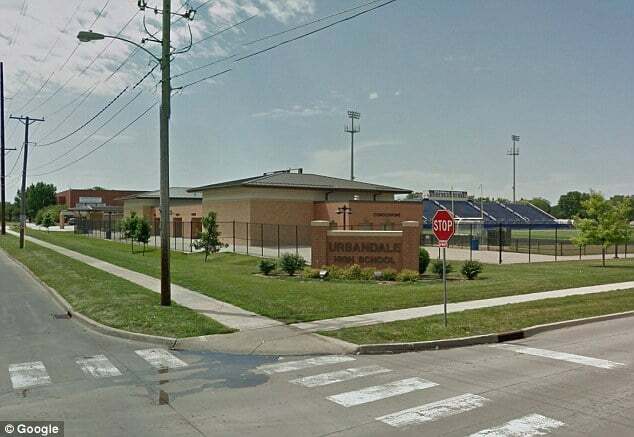 In the video, which Green titled, ‘Police Abuse, Civil Rights Violation at Urbandale High School,’ Green laments at his perceived ill treatment at the hands of police. He also accuses an officer of ‘assaulting’ him by ‘grabbing’ him and ‘shoving’ him around. 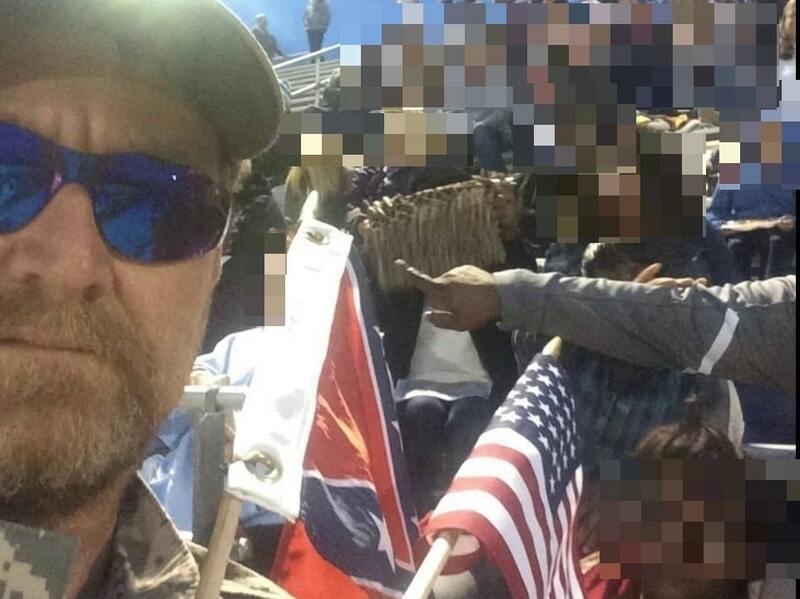 In the video, it’s asserted that Green was escorted off the football grounds after an officer told Greene that the Confederate flag he was holding was is in violation of school code. 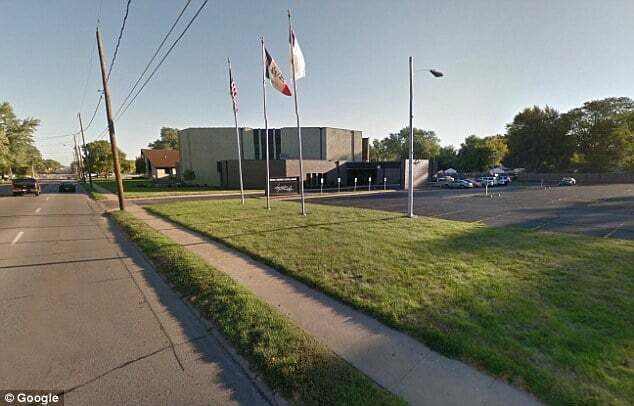 In the aftermath of Wednesday early morning’s shooting, the police department said it had doubled its officers, mandating that all officers must now patrol in groups of at least two until the gunman or gunmen are captured. ‘We’re always vigilant about our safety, but we’ve still got to go out there,’ Parizek said. Following the shootings, officers in SWAT gear were going door to door at the crime scenes, interviewing locals who may have witnessed the crime. According to Officer Down Memorial Page, 111 police officers have died in the line of duty this year, including three from Iowa. Forty-eight of these officers were killed by non-accidental gunfire. The shooting deaths of the two Iowa police officers follow the attacks on police this summer in Dallas and Baton Rouge in the wake of several high-profile police shootings of black men, fueling a national debate about police use of force, especially against minorities. Pictured, the area where the two shootings took place early Wednesday morning. Urbandale public schools have been cancelled for the day. The first officer was shot outside Urbandale High School (pictured above). Above, a daytime view of Merle Hay Road and Sheridan Drive, where the second officer was shot.